Iron Man is a 2008 American superhero film based on the Marvel Comics character of the same name. Directed by Jon Favreau, the film stars Robert Downey Jr. as Tony Stark, a billionaire industrialist and master engineer who builds a powered exoskeleton and becomes the technologically advanced superhero, Iron Man. Gwyneth Paltrow plays his personal assistant Pepper Potts, Terrence Howard plays military liaison James Rhodes and Jeff Bridges plays Stark Industries executive Obadiah Stane. The film was in development since 1990 at Universal Studios, 20th Century Fox, and New Line Cinema, before Marvel Studios reacquired the rights in 2006. Marvel put the project in production as its first self-financed film. Favreau signed on as director, aiming for a naturalistic feel, and he chose to shoot the film primarily in California, rejecting the East Coast setting of the comics to differentiate the film from numerous superhero films set in New York City-esque environments. During filming, the actors were free to create their own dialogue because pre-production was focused on the story and action. Rubber and metal versions of the armors, created by Stan Winston's company, were mixed with computer-generated imagery to create the title character. Marvel Studios and Paramount Pictures, the distributor, planned a $50 million marketing campaign for the film, which was modeled on Paramount's successful promotion of Transformers; Hasbro and Sega sold merchandise, and product placement deals were made with Audi, Burger King, LG and 7-Eleven. Reviews were mostly positive, particularly praising Downey's performance. 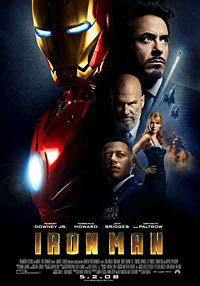 Downey, Favreau and Paltrow will return in the sequel Iron Man 2, scheduled for release on May 7, 2010. Downey also made a cameo appearance as Stark in The Incredible Hulk.